Graham M. Witherspoon Jr., was born Oct. 29, 1920. He was born and raised in Kansas City, Missouri, where he worked at his grandfather’s stock yards as a “cowpuncher” during his youth. His family had generations of cattlemen. Later, Witherspoon attended the University of Missouri where he attained a business degree. After he graduated he made an important decision to enlist in the Navy. Witherspoon served during World War II in the Pacific. His ship was stationed in Iwo Jima for several years, and that’s where he learned to navigate. As captain of the ship, he was responsible for the safety of the ship, crew and its passengers, which were normally troops. “I was a pretty good navigator, pretty good ship captain and a pretty good sailor,” shared Witherspoon. Once his time in the Navy came to a close, Witherspoon ended up in San Francisco where he found a job as a traveling sales representative. For 42 years, Witherspoon was a sales manager for the National Cash Registrars Company in different cities across the nation. He worked in Kansas City, Missouri; Dayton, Ohio; Oklahoma City, Oklahoma; and Houston, Texas. While in San Francisco, Witherspoon met the love of his life, Nina Herrington Witherspoon. The couple was introduced through a guy Nina was dating at the time. Witherspoon asked her to dance, and while dancing in front of her date, he asked for her number. The rest was history. Witherspoon and his wife enjoyed the good outdoors. They loved participating in various activities such as hiking and white water canoeing. Witherspoon and his wife hit all the high points. They climbed 34 of Colorado’s mountains that are over 14,000 feet in elevation. Witherspoon even painted one of their favorites, Pike’s Peak. The couple had three children, two daughters and a son, Christine, Nancy and John. Later in life, when Witherspoon was coping with his wife suffering from Alzheimer’s and son suffering with Schizophrenia, he was remained just as devoted. Through the trials and sadness of the illnesses of both his wife and son, Witherspoon needed to alleviate stress. He found a way to be creative and teach others about the debilitating diseases his family members dealt with. Witherspoon has authored 15-20 non-fiction books regarding Alzheimer’s (“The Taking Disease”), Schizophrenia (The Cruelest Disease”) and compilations of poetry (“Rhyme & Reason,” “The Adventurer,” etc.). Since the passing of his wife and son, Witherspoon has persisted with his artwork and poetry skills. He attends classes every Friday in order to perfect his skills and keep learning. He is one of the oldest students in his art class at the Community College of Aurora. 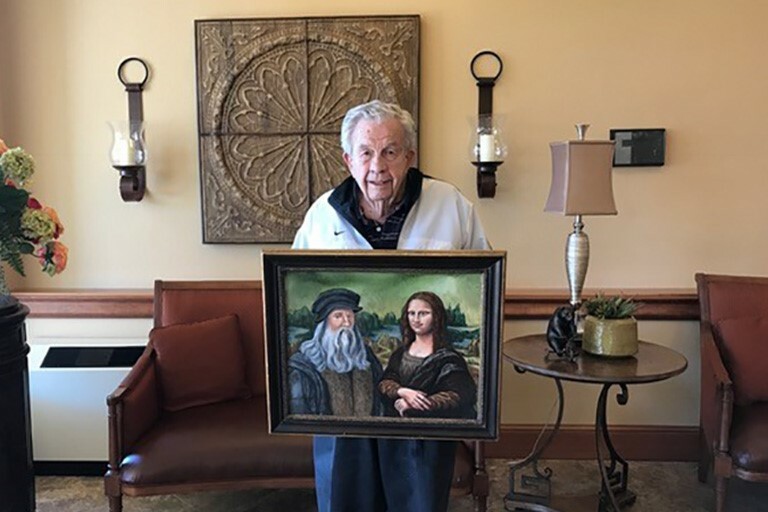 “Graham is known throughout Cherry Creek Retirement Village as an impeccable artist, philosopher and poet, as well as a wonderful writer,” shared Kim Schutt, sales and marketing director. Graham firmly believes that, “Old sailors never die; they just keep on sailing”. Witherspoon is not just a sailor, but someone who continues to write, paint, philosophize, care, share and believe. He is a passionate person that does not feel as if his age should counteract the desire to feel accomplished.